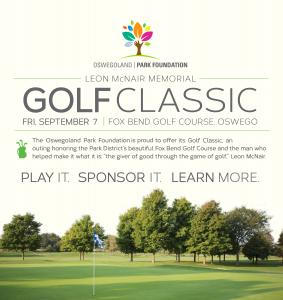 The Oswegoland Park Foundation is proud to host the Leon McNair Memorial Golf Classic, a golf outing honoring the Park District’s beautiful Fox Bend Golf Course and the man who helped make it what it is: “the giver of good for the game,” Leon McNair. Players will compete for the ”McNair Cup”, and a special tribute will be given in honor of Leon McNair’s memory: three $1,000 golf scholarships selected by the Leon McNair Memorial Fund. $500 per foursome (Includes 18 hole scramble, lunch, dinner, refreshments, prizes and more! Call Tom Tripp at 630.209.8615 or email ttripp@trippins.net for additional information. 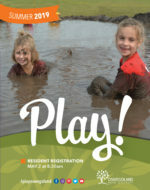 The Oswegoland Park Foundation is 501(c)(3) nonprofit organization dedicated to funding the development and enhancement of park district initiatives to create unique recreational experiences for the Oswegoland community. It focuses on projects not covered by local tax dollars and proceeds from the Classic for the Cup will be used toward that mission.